But there are only two of these to make, so that the possible error is the same as that to which we are liable in comparing two meter bars. This error is unavoidable. vibration as possible. Finally, the conditions which have been mentioned above for producing a suitable source of light had to be fulfilled. We have thus a fair idea of what conditions had to be met in constructing the complete apparatus for making this comparison. 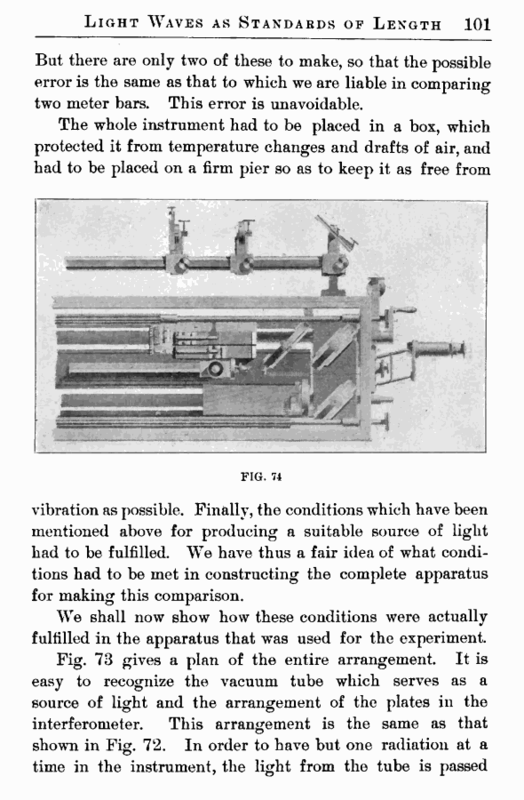 We shall now show how these conditions were actually fulfilled in the apparatus that wTas used for the experiment. lens x3 forms the spectral images of the slit tx in the plane of the slit /2* The arm Z W of the spectroscope can be moved so as to bring either the red, the green, or the blue spectral image upon this slit, from which it passes into the instrument. Fig. 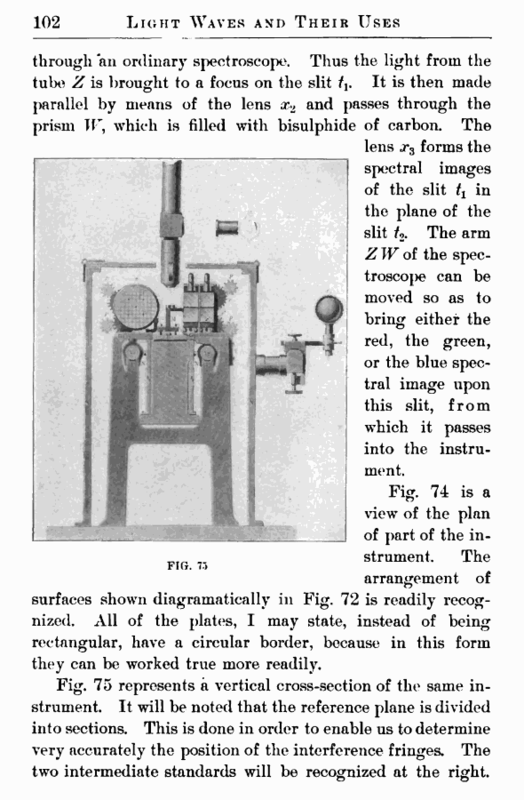 74 is a view of the plan of part of the instrument. The arrangement of surfaces shown diagramatically in Fig. 72 is readily recognized. All of the plates, I may state, instead of being rectangular, have a circular border, because in this form they can be worked true more readily. Fig. 75 represents a vertical cross-section of the same instrument. It will be noted that the reference plane is divided into sections. This is done in order to enable us to determine very accurately the position of the interference fringes. The two intermediate standards will be recognized at the right.